When I first spotted Cafe Nadery on this quickly growing, but still quiet section of 8th street, my interest was piqued. It appeared to have a quiet and leisurely vibe and really seemed more like a cafe for coffee and tea than a restaurant. 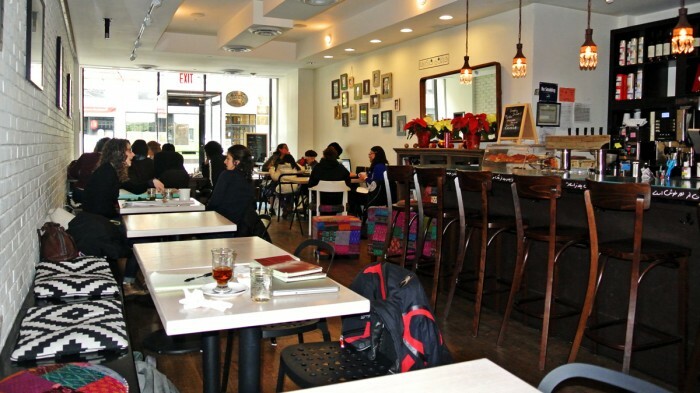 Functionally, it is a coffee shop in every respect with many of people plugged into their laptops working silently. The biggest difference between it and your usual coffee shop is that their kitchen prepares homestyle Persian comfort food. I don’t know much about Persian food, but I certainly wanted to try this very underrepresented cuisine in NYC. After my friend Evan joined me at the cafe for another adventure in ethnic cuisine, we quickly looked over the menu and placed our order. I decided to begin my meal with an appetizer simply named Roasted Eggplant. The dish took a pretty long time to come out, I’m hoping due to the time it takes to roast it to order. I’m glad I was patient though. Once it arrived, I was treated to something really extraordinary. The eggplant was oven roasted until creamy, smokey, rich, and full of flavor. 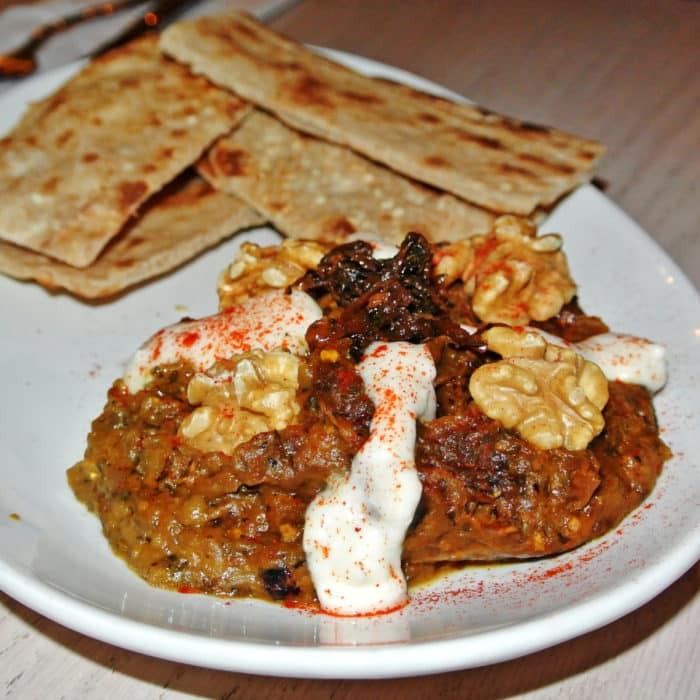 The dish, while not spicy, was absolutely loaded with Middle Eastern spices and came topped with caramelized onions, walnuts, and a yogurt-like topping called kashk. It also came with a flatbread similar to a pita called sangak that paired really well with the awesomely creamy and smokey spreadable eggplant. Following my eggplant appetizer, on a hunch, I ordered a bowl of a classic Persian dish called Ash-E Reshteh (ah-SHEH rehsh-TEH). The texture of this dish fell somewhere between soup, stew, and chili and was extremely comforting and satisfying. It had a strong herbal taste with plenty of Persian spices and flavors bursting throughout. Online, they describe it as a bean, herb and noodle gumbo which I think is a pretty fair description. I’ll definitely be back for more when I need some soul food. 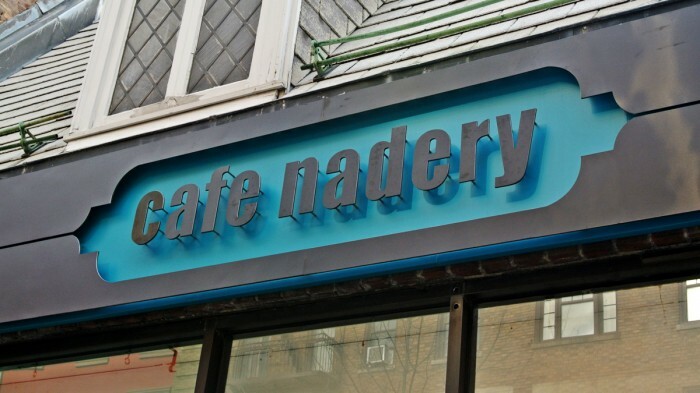 In conclusion, if you’ve never had Persian food before, but love the flavors of the Middle East, check out Cafe Nadery. The atmosphere is calming and relaxing and their food is super-comforting, especially during the cold winter months. Plus, that Ash-E Reshteh is not to be missed. 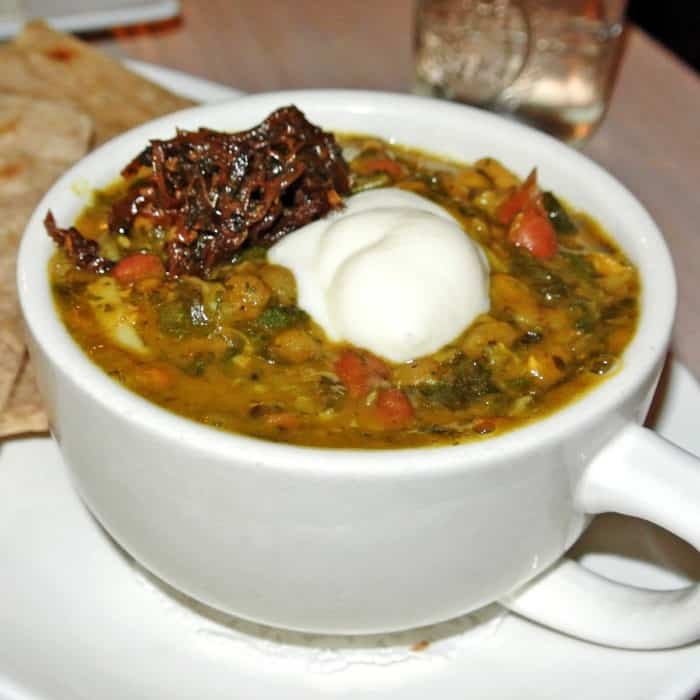 Know an ethnic eatery with an unusual dish I need to check out? Let me know in the comments below! Oh yes, definitely. That’s been on my todo list for a while now too. Let’s go sometime! Deal, it’s right near where Mishu works, too. Also, I’ll be doing rotations at Elmhurst hospital next year so if you will want to explore that neighborhood more in the future I will be game! Sounds great, I’d love to explore Elmhurst more too.